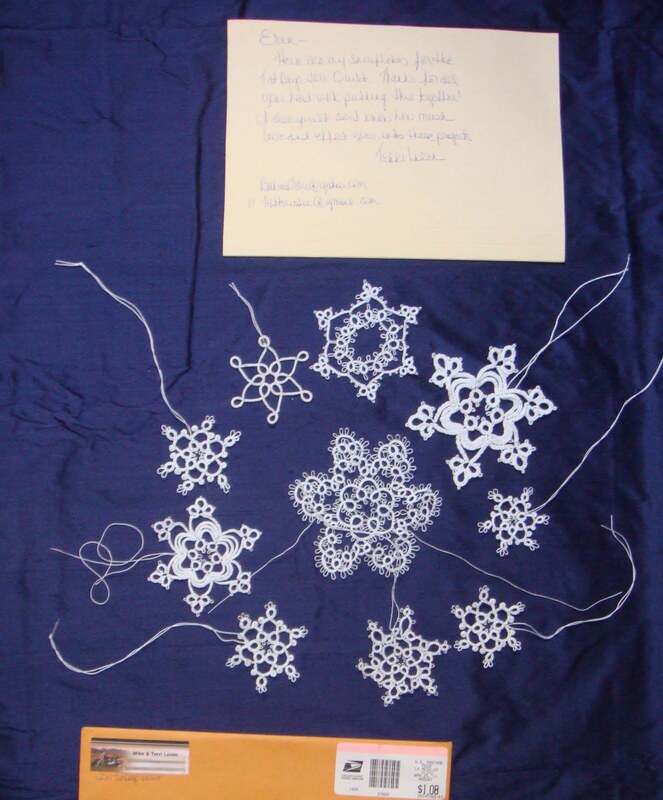 Tatting in a Winter Wonderland! 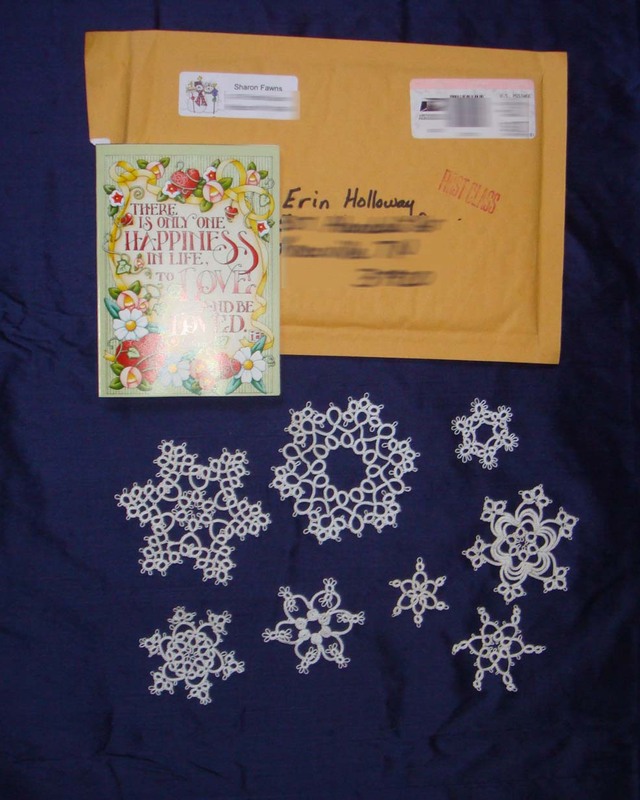 And Sharon Fawns is our tatting snow-cloud! Thank you, Sharon! And isn't that a sweet card. 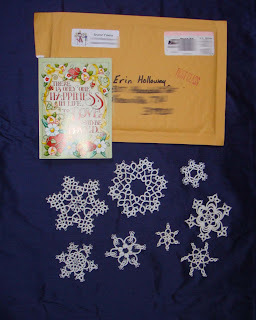 I love Mary Engelbreit, and those snowflakes, too! And it's on its way here for more picture-taking and I'm so excited! 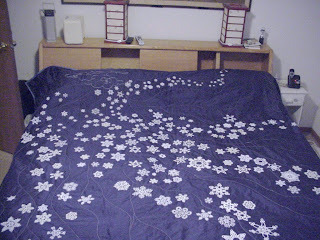 Pinky did a BeeeYooDeeFul job quilting it. Wow. From Terri Loren. 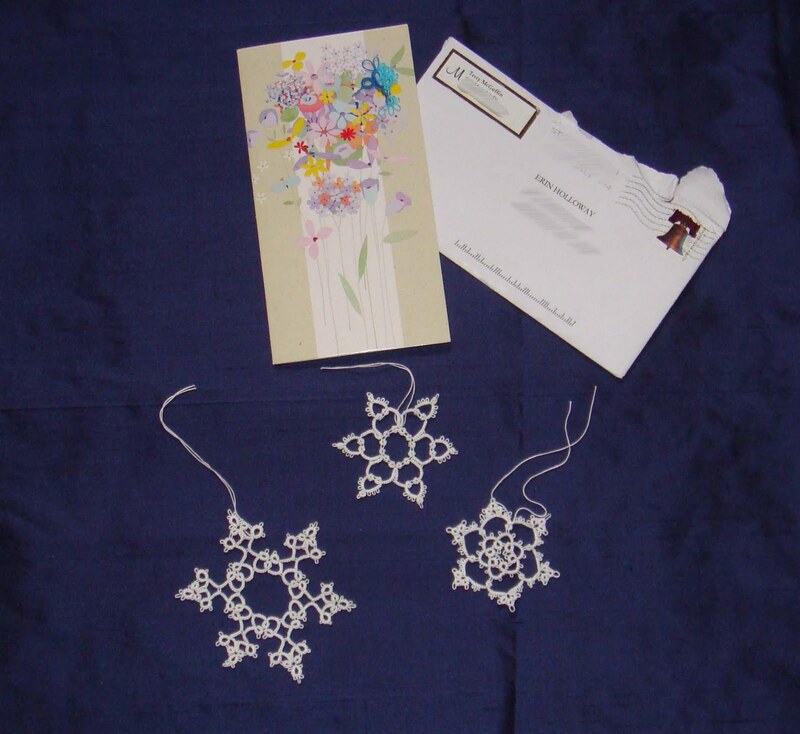 Thank you for the snowflakes and the sweet note! 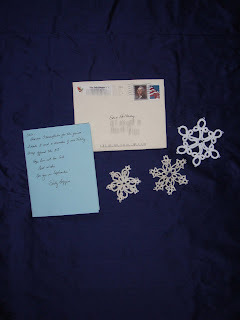 All the way from North Carolina (my neck of the woods) we have these beautiful snowflakes by Sally Biggers. Thank you, Sally! Sally's flakes bring our "revealed snowflakes" total to 145. It snowed in New Mexico! 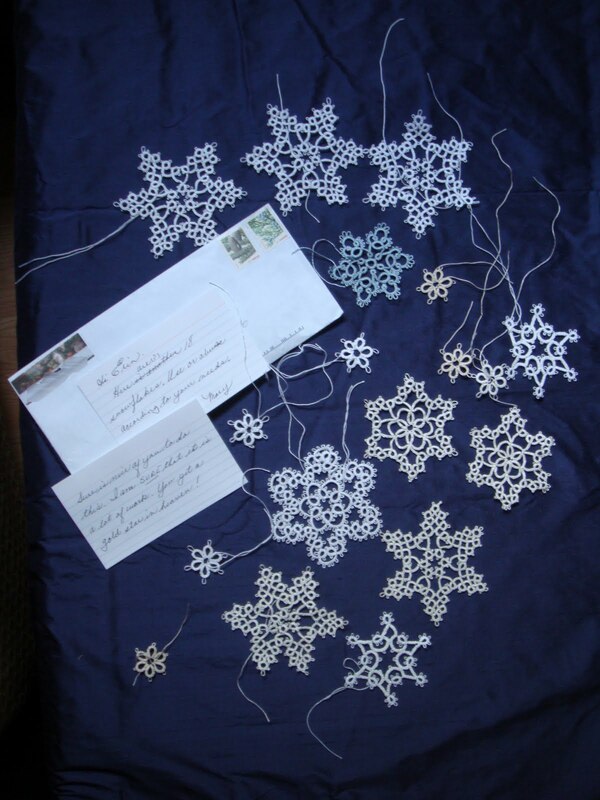 Miranda Rensberger sent these dainty beauties. The purple one has a special place it's going, too! Very pretty! Terry McGuffin is our pal! I adore Terry. I don't know of anyone who doesn't. She's tops in my book. For those of you who aren't familiar with her work, she's Terry the Tatter who writes the most wonderful ornament books. You can visit at her website. Terry has been kind enough to send flakes on the "installment plan". Here is one of her offerings. Look at the pretty card! See that adorable little hummer? Thanks, Terry! This brings our total of "revealed" flakes to 139. Whew! Let's crank the blizzard up, shall we? From funny, funny Mary Harris. I have truly been blessed to be involved in this project. I got the nicest notes from the sweetest people. 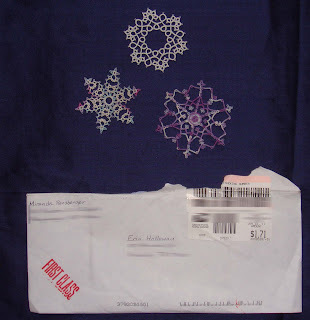 I had *months* where I actually looked forward to receiving mail every day! That's saying something! 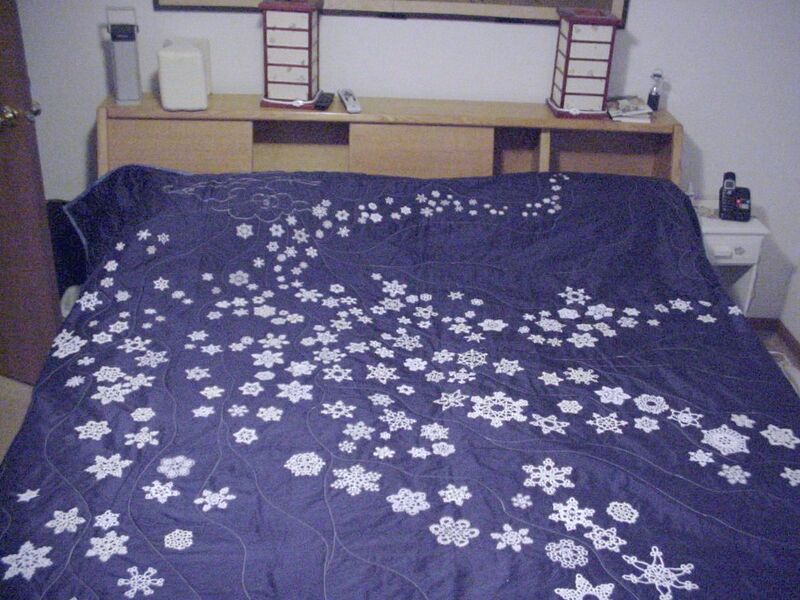 How can you own this quilt?